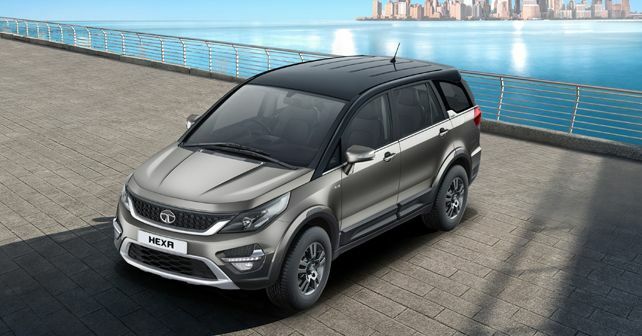 To mark the Hexa's second anniversary, Tata Motors has introduced a 2019 version of its mega SUV with an updated style quotient and some additional features. The Tata Hexa is really a one-off in the homegrown manufacturer's lineup, owing to its rather large proportions. However, most of us agree that it looks a bit outdated when stacked against its competitors. After completing two years in the industry since its launch in January 2017, Tata has decided to refresh the Hexa (visually) by introducing a dual-tone paint scheme across the entire range, along with a few new designs and finishes for the alloy wheels. To keep millennials happy, Tata has also added a 7-inch touchscreen that controls the 10-speaker Harman audio system. The infotainment system also gets Android Auto connectivity now. The Hexa 2019 edition will be available in five exterior colour options, while the top end variants will be up for grabs with a dual-tone roof option. The dual-tone paint scheme consists of an Infinity Black and Titanium Grey colour combo (as shown in the image). Further, the automatic variants of the Hexa 2019 Edition will be offered with new, diamond-cut alloy wheels, whereas the manual variants will continue to roll on the same alloy wheels as before but in a Charcoal Grey finish.